Suppose for a moment you’re an attorney serving a client in a contested divorce. Included in the marital property is a very profitable consulting firm. Your client is the primary operator of the business, and wishes to own it exclusively after the divorce. The spouse has no interest in owning the business after the divorce. Is it in your client’s best interest to obtain the lowest valuation of that business you can get? One of the senior partners at your firm suggests a business valuation expert from a large local CPA firm, saying with a wink “Harry will get the number you need.” He also tells you that Harry has served as an expert witness for your firm more than one hundred times over two decades. You decide to check with your CPA also. He refers you to Cathy, a CPA with valuation credentials and ten years of experience. Cathy works for a small firm that specializes in business valuation. She rarely serves as an expert witness; the majority of her work is related to the buying and selling of businesses. After you call Cathy and explain your circumstances, she tells you that she can accept the engagement, provided you understand that she will not steer the outcome of her analysis in one direction or another. “My number is my number,” she declares. Which expert will better serve the interests of your client? Many attorneys will recommend hiring the expert who will give you an answer skewed in your favor. They will argue that the judge will split the difference between the two values, assuming both reports are equally skewed. If your report is not equally skewed, you will be ceding ground to the opposition. 1. Business valuation reports are so inherently technical that an accurate report with sound logic is indistinguishable from one that is not. 2. Judges are incapable of recognizing the differences between a sound valuation report and one that contains a skewed result. Further they are equally ill equipped to discern the significance of the expert witnesses’ criticisms of each other’s reports. 3. The credibility and experience of the expert witness is far more important than the quality and accuracy of their work. Judges, not being able to discern a good analysis from bad, will evaluate the experts based on their credentials and experience, and will weigh their testimony and conclusions based on their relative credibility. Based on my experience and my readings of judicial opinions in valuation cases, all three of these assumptions are false in the majority of cases. 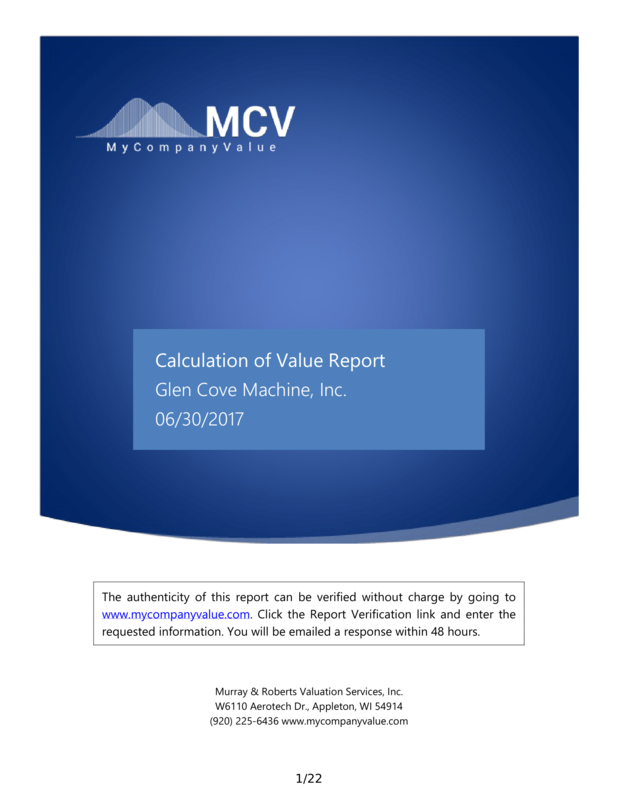 Valuation reports are inherently technical, however the logic applied in a well-written report should be understandable to anyone with a solid grasp of standard financial investment principles (return on investment, present value, etc.) Given that judges have the opportunity to read two reports regarding the same company, hear the authors’ explanations of their logic, and hear the experts’ criticisms of each other’s reports, most judges are very capable of evaluating the merits of an expert’s opinion. Most judges will also be able to identify and quantify those little inaccuracies that tend to skew a conclusion of value in one direction or another. Judges will also base their opinion of the expert witnesses’ credibility – in part – on the quality of their report, their testimony, and their responses to cross-examination. The very foundations of valuation practice are the product of judicial opinions in cases arising from a tax break offered to companies hurt by the enactment of prohibition. Several of the IRS most prominent Revenue Rulings are the product of judicial opinions. Judicial opinions have continuously served as a guide to professionals’ best valuation practices, with particular emphasis on the most contentious theoretical topics. Choosing the ‘hired gun’ will cost your client more, in most cases. If you present a valuation report with well-substantiated logical conclusions, the opposing side may accept your expert’s opinion of value. In most cases this would dramatically improve the chances for a negotiated settlement, saving your client significant time and expense. Even if the opposition does not accept your expert’s opinion out of hand, after hiring their own expert they may conclude that your value estimate was reasonable, which again increases the probability of a negotiated settlement. If your report is highly skewed, you have almost certainly assured your client an expensive court battle involving multiple expert witnesses, depositions, and court appearances. Finally, a skewed report may cause your client to have unrealistic expectations, which frequently result in disappointment. It is very probable that the estimate of value in a skewed report (which inherently contains some inaccuracies or omissions in order to reach its skewed conclusions) will be completely disregarded if a knowledgeable judge is comparing it to a well-written reasonably valued opinion. You may argue that your client hasn't lost anything in such a case. I disagree. Because the judge has completely accepted the opposing side’s value, you have lost the smaller more realistic negotiating opportunity that reasonably exists in every company. Your client has also spent tens of thousands of dollars more to achieve a result that they may have obtained months earlier.